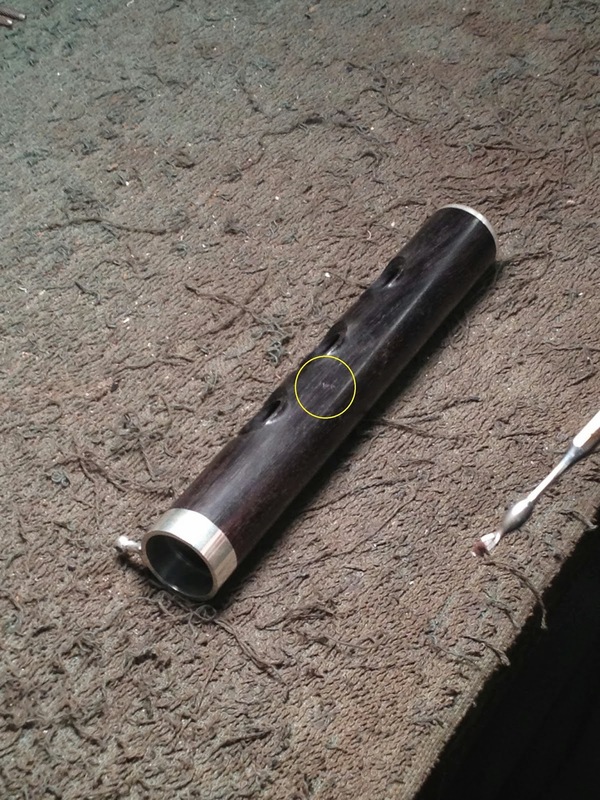 We've seen previous posts about repairing dents and dings in metal flute bodies and headjoints, but what happens when there is a nick in a wooden flute? Well, we happened to be in the wood shop this past week to see how this could be remedied. Nick has been circled in yellow. Getting grenadilla dust ready to fill the nick. Applying the dust to fill in the nick. Just a bit more dust on top of the filled area. Filled and ready for glue. Adding the adhesive glue over the dust filling. Glue doesn't take long to dry. Filing the glue down with a mill file to blend it in. Using sandpaper for final blending. And it's done! A little more oil was applied after blending. Nick is gone!